Our March 2018 issue is live. Our first issue of the year focuses solely on oncology. We start 2018 with an issue dedicated entirely to oncology. We showcase a number of companies working in the field, focusing on areas such as immunotherapies, combination therapies, personalized medicine, diagnostics and biosimilars. 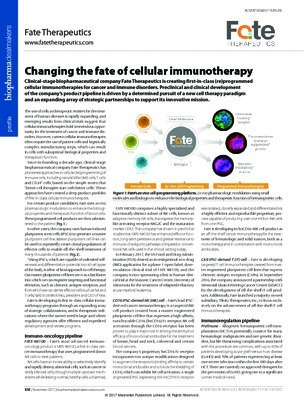 We also feature an editorial piece which covers recent trends in oncology dealmaking. With the help of Clarivate Analytics we explore the oncology licensing deals of the last 5 years analysing by company, value, volume and development stage. Hello all, I am the Editor of BioPharma Dealmakers, a quarterly publication that assists companies in identifying potential partners in the pharmaceutical and biotechnology industry and appears in both Nature Biotechnology and Nature Reviews Drug Discovery. I am very passionate about the biopharma industry and have over 12 years of experience of working in the field, specifically in dealmaking, partnering and licensing. In my previous roles I have conducted partner searches identifying both products/technologies and partners for clients, and have edited and written dealmaking-focused reports.